BOUNCING BERRY ALERT! Cranberries have lots of fiber, vitamin C, and other substances that make them a healthy food. They are thought to help protect us from urinary tract infections, as well as cancer and heart disease. Blend cranberry sauce, vinegar, sugar and half of the feta cheese in a blender. Slowly add oil. Place greens on plate and top with turkey, pecans, cranberries. Pour dressing over this mixture. Sprinkle remaining feta cheese over top. BOUNCING BERRY ALERT! Cranberry juice contains a chemical that blocks pathogens that cause tooth decay. Boil ingredients together and cool. Before serving, add apples, dried cranberries, nuts, bananas, and marshmallows. 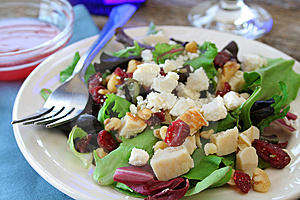 Directions: Toss greens, cranberries, cheese, and walnuts.Whisk vinegar, honey, mustard, and pepper until well blended.Add oil gradually, continuing to whisk until well blended.Pour over salad; toss to coat. Go to WondrousStory.com for a variety of discount cookbooks.